The Westinghouse WGen3600v Gasoline Powered Portable Generator is the convenient way to provide power to your home during a power outage or keep you comfortable in your RV travel trailer. With 4,650 peak watts and 3,600 running watts, this generator is a workhorse that can run up to 18 hours at a time with a 4 Gal. (15 L) fuel tank. An intuitive control panel makes the WGen3600v easy to operate with rubber covered power outlets to provide additional protection from the environment and rugged conditions. The WGen3600v features a powerful 212cc 4-Stroke OHV Westinghouse Engine that is designed with reliability and durability in mind, and features Automatic Low Oil Shutdown. The WGen3600v Portable Generator is complete with a 3-Year Warranty and Lifetime Technical Support, backed by our nationwide Westinghouse customer service and support network. The WGen3600v portable generator is backed by a 3-year limited warranty and Westinghouse's lifetime technical support. The DEWALT DXGN4200 is designed with the professional contractor in mind. This unit is powered by a 270cc Honda GX270 manual start OHV engine with auto shut off for low oil. The premium alternator provides low harmonic distortion. The large 7 Gal. tank with fuel gauge runs up to 15 hours at 50% load. Features include a hydraulic/magnetic circuit breaker that provides overload protection, a digital hour meter for monitoring run time and tracking maintenance and an idle control to reduce noise and save fuel. The steel frame is job site tested and includes a lifting hook. An optional wheel kit in available. The DEWALT DXGN6000 is designed with the professional contractor or rental operator in mind. This unit is powered by a 389 cc Honda GX340 manual start OHV engine with auto shut off for low oil. The premium alternator provides low harmonic distortion. The large 8 Gal. tank with fuel gauge runs up to 14 hours at 50% load. Features include a hydraulic/magnetic circuit breaker that provides overload protection, a digital hour meter for monitoring run time and tracking maintenance and an idle control to reduce noise and save fuel. The steel frame is job site tested and includes a lifting hook. An optional wheel kit in available. The DEWALT DXGN7200 is designed with the professional contractor or rental operator in mind. This unit is powered by a 389cc Honda GX390 manual/electric start OHV engine with auto shut off for low oil. The premium alternator provides low harmonic distortion. The large 30.3 L tank with fuel gauge runs up to 13 hours at 50% load. Features include a hydraulic/magnetic circuit breaker that provides overload protection, a digital hour meter for monitoring run time and tracking maintenance and an idle control to reduce noise and save fuel. The steel frame is job site tested and includes a lifting hook. An optional wheel kit is available. The P03605 portable generator builds on the powerful legacy of the open frame series, offering amazing performance, quality and versatility. Best used for camping, work-site and emergency power. 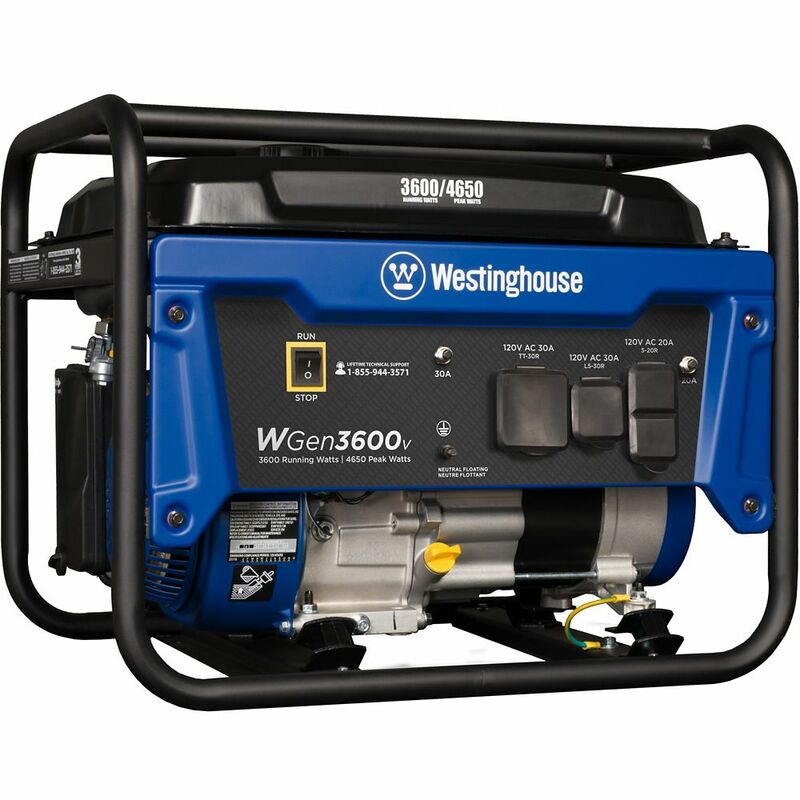 WGen3600v Portable Generator The Westinghouse WGen3600v Gasoline Powered Portable Generator is the convenient way to provide power to your home during a power outage or keep you comfortable in your RV travel trailer. With 4,650 peak watts and 3,600 running watts, this generator is a workhorse that can run up to 18 hours at a time with a 4 Gal. (15 L) fuel tank. An intuitive control panel makes the WGen3600v easy to operate with rubber covered power outlets to provide additional protection from the environment and rugged conditions. The WGen3600v features a powerful 212cc 4-Stroke OHV Westinghouse Engine that is designed with reliability and durability in mind, and features Automatic Low Oil Shutdown. The WGen3600v Portable Generator is complete with a 3-Year Warranty and Lifetime Technical Support, backed by our nationwide Westinghouse customer service and support network. WGen3600v Portable Generator is rated 4.7 out of 5 by 256. Rated 5 out of 5 by Anonymous from Great Generator I bought this generator to power my travel trailer when dry camping. I prepped ity according to the instructions, it started right up. Hooked it to my camper, ran the A/C, microwave, and awning , and a battery charger for my car all at the same time, never seemed to strain. Very quiet to boot. perfect for what I need it for. Rated 5 out of 5 by Michael from Shipping was very Quick. Put synthetic oil in it Gas... Shipping was very Quick. Put synthetic oil in it Gas and it started first pull. Only ran for a couple minutes to check things out everything seems Good. Runs fairly quiet also. Rated 5 out of 5 by SCOTTW from WORKS GREAT WORKS LIKE A CHAMP, NEVER MISSED A BEAT. EAST TO UNDERSTAND AND USE. Rated 5 out of 5 by BigSkyView from Started on first pull right out of the box. Used twice now to run two sump pumps at once (plugged... Started on first pull right out of the box. Used twice now to run two sump pumps at once (plugged in and started seperately). Ran it for about 2 hours so far. Performed flawlessly. I think it runs quieter than my other higher priced generator. Light enough to move around easily. Rated 3 out of 5 by Sean from Said it was much lower decimal than it really is.... Said it was much lower decimal than it really is. Was one of the main reasons I bought it. Will probably rerun based on this. It does run my trailer with the Ac on.